Mountainboarding, also known as Dirtboarding, Offroad Boarding, and All-Terrain Boarding (ATB), is a well established if little-known action sport, derived from snowboarding. A mountainboard is made up of components including a deck, bindings to secure the rider to the deck, four wheels with pneumatic tires, and two steering mechanisms known as trucks. Mountainboarders, also known as riders, ride specifically designed boardercross tracks, slopestyle parks, grass hills, woodlands, gravel tracks, streets, skateparks, ski resorts, BMX courses and mountain bike trails. It is this ability to ride such a variety of terrain that makes mountainboarding different from other board sports. Morton Hellig's 'Supercruiser Inc.' was the first company to manufacture and retail the 'All Terrain Dirtboard', patented in 1989. Mountainboarding (name coined by Jason Lee) began in the UK, the USA and Australia in 1992. Unknown to each other, riders from other boardsports started to design and build, and eventually manufacture boards that could be ridden off-road. This desire to expand the possible terrain that a boarder can ride created the sport of Mountainboarding. Dave and Pete Tatham, Joe Inglis and Jim Aveline, whilst looking for an off-season alternative to surfing and snowboarding, began designing boards that could be ridden down hills. Inglis developed initial prototypes, and in 1992 noSno was started. Extensive research and development produced the noSno truck system which enabled the boards to be steered and remain stable at high speeds. 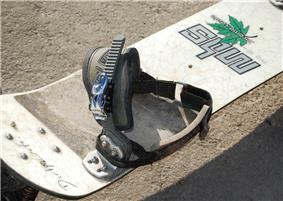 NoSno boards utilised snowboard bindings and boots, with large tyres for rough ground, and the option for a hand-operated hydraulic disc brake. In 1992, after having snowboarded at Heavenly Valley Resort in Northern California, friends Jason Lee, Patrick McConnell and Joel Lee went looking for an alternative for the summer season. Not finding anything suitable they co-founded MountainBoardSports (MBS) in 1993 to build boards that they could use to carve down hills. The original MBS boards, known as 'Frame Boards' had a small wooden deck metal posts to hold the rider's feet, a tubular metal frame connecting trucks which used springs to enable steering and thus create the carving sensation that the MBS co-founders were looking for. The first recorded mountainboarding act occurred in the summer of 1978, when local skateboarder Mike Motta residing in Medford Massachusetts navigated down a hill known as Seven Bumps in Malden Massachusetts on a bet, using a standard Franklin skateboard. John Milne developed a three-wheeled version of a mountainboard in 1992 in his spare time during periods of very poor surf. It used a unique steering system to emulate surfing on land. It had 3 wheels and a skate-style deck with no bindings. ^ Alexa Konstand ( More Posts) (2009-09-02). "Twighlight Showdown Mountainboard Championships Were a Success". The Ski Channel. Retrieved 2012-08-17. ^ "Mountainboard News You Need". The Dirt. Retrieved 2012-08-17. ^ "Surfing Dirt Mountainboarding Community". Surfingdirt.com. Retrieved 2012-08-17. ^ "Remolition Mountainboarding | Mountainboarding at it's best". Remolition.com. Retrieved 2012-08-17. ^ "Mountainboarding - The Beginners Guide". Mountainboarding.uk.com. Retrieved 2012-08-17. It's the site of the Official Italy Association and community that publicise events, news, and other information relating to Italian Mountainboard and Kitelandboard community. The mountainboard Italian association (MIA), is the network for the local mountainboard community (Bergamo www.ambg.it, Pavia-Piacenza www.progettopenice.it, Torino, Brescia, Parma). Mountainboard in Italy is official present in the CONI (Italian National Olympic Committee), within the FIHP (Italian hockey and skating federation), and MIA is the contact officer for the Mountainboard. It's the site of the Portuguese community that publicise events, news, and other information relating to Portuguese Mountainboard and Kitelandboard community. They also organize "Demo Days" when they provide material that will give people a new experience and thus promote the sport! The ATBA-UK (French Mountainboard Association is a community that publicise events, news, and other information relating to French mountainboarding. The IMA (International Mountainboard Association) aims to help worldwide mountainboard scenes promote their events, identify the best dates, find some useful guidelines, and promote their sponsors. The Dirt. US based mountainboard blog & news site. Surfing Dirt. International mountainboarders community forum. Remolition. Free mountainboard webzine with regular features. The Guardian. What do snowboarders do when faced with the perennially powderless slopes of the UK? They find the nearest verdant hill and hurtle down it. Tim Moore and son go gung-ho in Surrey. The Telegraph. Jonny Beardsall loses balance and bottle as he faces a 40 mph slalom on a mountain board. Mountainboard Aux Saisies TV coverage of the 2009 noSno World Downhill Championships, from the French TV channel Savoie ACTU. History Channel. The history of extreme sport on the History Channel. Featuring Mountainboarding and many other board sports. They Think It's All Over. Pete and Dave Tatham from noSno taking part in "Guess the sportsman" on BBC's sports comedy program "They think it's all over"
Park City TV: What is Mountainboarding? The Utah DirtStar Army team on Park City TV in late 2005. Good Morning Utah. The DirtStar Army live on Good Morning Utah 2005. US Open Mountainboard Championships 2006, held in Snowmass, Colorado. JSP TV talks with the youth division winner and the director of the Dirt Dogs. Toasted TV. Interview with Munroboards team rider Ryan Slater on the Channel 10 show toasted TV. Domino's Pizza. "That was Puff" commercial featuring mountainboarders: Ryan Slater, Clint Farqhuar, Markus Lubitz, Adam Zemunic. Horizon TV. Willingen D-MAX World Series Mountainboard 2007. Rockon. TV report on WDR on the mountain board park opening in Winterberg. At Your Leisure: The DirtStar Army. TV report on Utah's DSA mountain board team ripping up the Park City dirt jumps. Top Gear. TV item showing a staged race between Tom Kirkman and a Mitsubishi Evo rally car and Bowler Wildcat. Friday Download. Kids TV report on mountain boarding (2012). Johnny Kapahala: Back on Board is the 70th Disney Channel Original Movie and is the sequel to the 1999 film Johnny Tsunami. Its popularity encouraged people to take interest in the extreme sport. Off-Road Boarding Magazine founded in '99 with its editor Brian Bishop and other dedicated riders. It ran numerous pictorials, US riding spots, rider profiles and carried virtually no ads. It started small, and was given away at comps and shops. 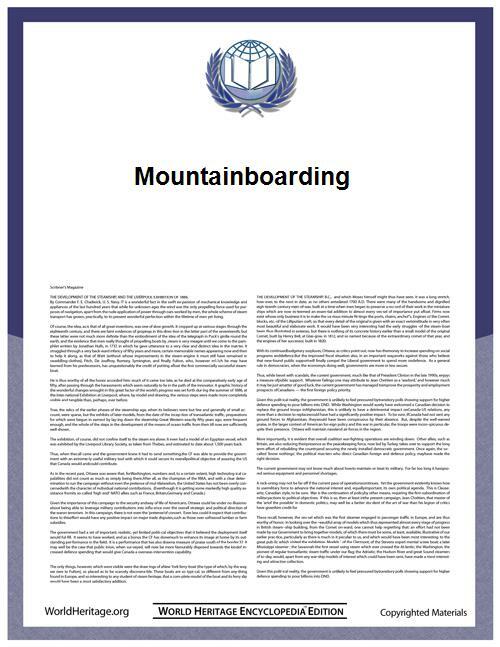 The last issue of the mag was printed in full color and a new name "Mountainboard Magazine". The new title was later adopted by a UK publisher. All Terrain Boarding Magazine aka ATBMag: The longest running, 4 years, and only Mountainboard magazine to make it onto mainstream newsagent shelves. Distributed worldwide it ran to 39 copies and one photo album featuring the work of Paul Taylor. ATBMag was also responsible for the creation of the World Freestyle Championships, running it for the first 2 years. It also created the World Series, taking place in 12 countries. ATBmag sponsored a team of riders, who were later sponsored by EXIT. The team featured Tom Kirkman, Laurie Kaye, Alex Downie, Oli Morrison, Arno Van Den Vejver, Ig Wilkinson, Jack Chew and Tuai Lovejoy. 2005 saw the team take to Europe and ride in 7 countries following the World Series Tour. In 2006 the magazine made its final issue. Scuz Mountainboarding Zine was first published in July 2004 as a paid-for magazine, however subsequent issues were published and distributed for free both as a printed hardcopy version and on the internet as a downloadable PDF. It was announced in October 2006 that issue twelve would be the final issue. Mountainboard Magazine was produced by the same people who created scuz, and it was re-branded to suit changing trends in mountainboarding, and a cover charge was introduced to help pay for the costs involved in producing the magazine as the advertising featured was sufficient. Only one issue was ever printed. Mountainboarding Video Magazine (MVM) The only video mag to showcase mountain boarding from around the world. This publication only made nine issues, co-produced and edited by Justin Rhodes, Van DeWitt, and Brett Dooley. UKATB ran for 6 years between 2000 and 2006 and was the first website to feature in-depth advice and tips from board maintenance to ramp building and trick tips. At its peak the site attracted over 10 000 unique visitors a month. The following are some of the numerous publications Mountain Boarding has had in various news media outlets and other media, including for the annual Mountain Board US Open in Snowmass and the Twighlight Showdown Mountainboard Championships. Similar all terrain boardsports include Dirtsurfing and Kiteboarding. Non-competitive riding over a range of natural terrain including woodland. Two to four-man racing on a specifically designed track. Helmets - are designed to protect the wearer's head from falls and damage to the brain. There are two types; full-face, which provides more protection to the wearer, and open face, which provides greater visibility for the wearer. Wristguards - are designed to protect the wearer's wrists from impacts. They come in two types, gloves and wrap-arounds, but both include plastic splints which prevent the wearers wrists from bending backwards during a fall and protect the palms against cuts and grazes. Elbow pads - are designed to protect the wearer's elbows from impact during falls. Sometimes forearm guards are incorporated into the elbow pads. Knee pads - are designed to protect the wearer's knees from impact during falls. Padded Shorts - are designed to protect the wearer's hips, coccyx, and buttocks from impact during falls. Body Armour - is designed to protect the wearer's upper body, arms, shoulders and back from impact during falls. Mountainboarders wear a range of protective equipment while riding. Cable-pull 'V' Brakes also use the hub or metal discs as a braking surface. The hand operated lever pulls a metal cable to push polyurethane blocks against the braking surface. Advantages include low cost, low weight, and easy installation and maintenance. Disadvantages include low braking power, and the need to be regularly adjusted. Wheels are made up of plastic or metal hubs and pneumatic tires ranging in size of 8–13 inches. The 8" wheel has evolved into the best choice for freestyle riding, and also an all purpose wheel for general riding. Larger wheels (generally 9" and 10") are more useful to the downhill rider; granting the rider access to high-speed runs and more stability when travelling at speed. NoSno trucks use two 'kingpin'-type bolts to create a floating pivot, an axle with a plate into which the bolts go, an angled base plate that attaches to the deck, and polyurethane bushings to dampen the turn. The amount of turn available in the trucks can be adjusted by tightening the bolts or by using bushings of different hardness. A similar design was adopted by Howla Mountainboards for the limited time that they manufactured boards. Also, the effectiveness of springs as employed in current (2009) channel truck designs is open to debate. In a "Coil over Oil" shock, the extension of the spring is dampened as well as contraction. In a channel truck design, this is not the case as the damper sits freely inside the spring—therefore only contraction is dampened, not extension. This means that when a spring ceases to be under load and extends, it can extend past the equilibrium point. The 'shocks' present in channel trucks are there to dampen the turning system, and help reduce the oscillations of the trucks on the board commonly described as speed wobble. The springs are there to return the deck to centre after a turn has been performed, neither are there to provide suspension between the deck and axles. They have a kingpin that can't move vertically which prevents this. 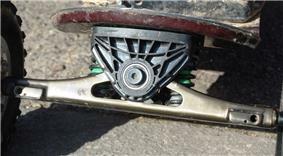 Channel trucks are common on mountainboards, and are made up of an axles mounted to the truck bottom piece, which is suspended from a top hanger by a kingpin. They are mounted to the deck using nuts and bolts through the hanger part, on an angle, (usually 35°). When the board is tilted laterally the axles turn together to angle the wheels in the direction of the turn. 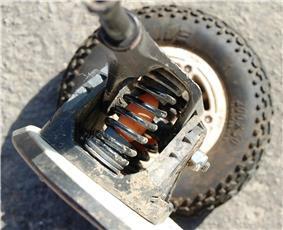 Two polyurethane dampers sometimes known as "egg shocks" are mounted between the hanger and the axle housing on each truck to provide resistance to the lean of the rider during turning. Springs are mounted in the same place with the dampers inside them. Mountainboard decks are the part that most of the components are attached to, and provide the base for the rider to stand on. They are generally from 90–110 cm in length, and can be made from a range of construction methods and materials. For example high specification boards may be made from composite carbon and glass reinforced plastics, possibly with a wooden core, similarly made to a snowboard deck. Basic decks are generally made using laminated wood pressed into shape, comparable to a longboard deck with larger dimensions and a different shape. There are variable characteristics such as flex, weight, shape, length and tip angle that can be catered for in custom or stock boards from a variety of manufacturers. As of recent there have been some powered mountain boards gaining traction in the board enthusiast world. 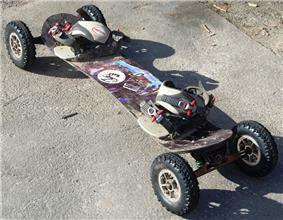 Small gas or electric motors attached to allow for mountainboarding to be done on flat ground or to climb hills rather than just going downhill. Sebastian Fayad has been making the most forward progress and innovations in recent years with his Nitro Boards line that features a 4 stroke gas engine and higher performance boards.